Provide comfort for the family of Leland Copeland with a meaningful gesture of sympathy. 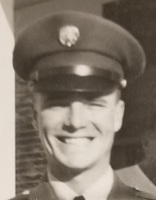 Leland Copeland, 80, of Yorktown, passed away December 21, 2018. He was born October 30, 1938, in Smiley to the late Carl Copeland, Sr and Lillie Schaffner Copeland. Leland was preceded in death by his parents and brother, Carl Copeland, Jr. He is survived by his wife of 24 years, Pat Copeland; sons, Ray Copeland (Raquel), Mike Bowser and Larry Priest; daughters, Linda Taft (Paul), Candie Gabrielse and Bonnie Kirk (Ward); 15 grandchildren; 5 great-grandchildren; numerous nieces and nephews. On Friday, December 28, 2018, there will be a visitation at 10:00am with a service at 11:00am at Church of Jesus Christ of Latter Day Saints in Yorktown. Interment will follow at Nordheim Cemetery with a Masonic service. To send flowers in memory of Leland Copeland, please visit our Heartfelt Sympathies Store. Glenn & Betty Boggs sent flowers to the family of Leland Copeland. Glenn & Betty Boggs purchased the The FTD Loving Light Dishgarden for the family of Leland Copeland. My condolences to the Copeland family during this difficult time. In the Bible, Jehovah God gives us hope. Acts 24:15 says, “there is going to be a resurrection of both the righteous and the unrighteous.” Revelation 21:4 says, “and he will wipe out every tear from their eyes and death will be no more.” Very soon we will see the fulfillment of these promises here on Earth. Dear Linda and Ray and other family members, please except our condolences on the lost of your dear father. We were saddened by the news and will keep you all in our thoughts and prayers at this difficult time. Sorry none of us will be able to attend but will definitely be there i n spirit. So sorry for your loss.